StencilGirl Talk: Kymona Tracey: 7 Creations with StencilGirl Products! 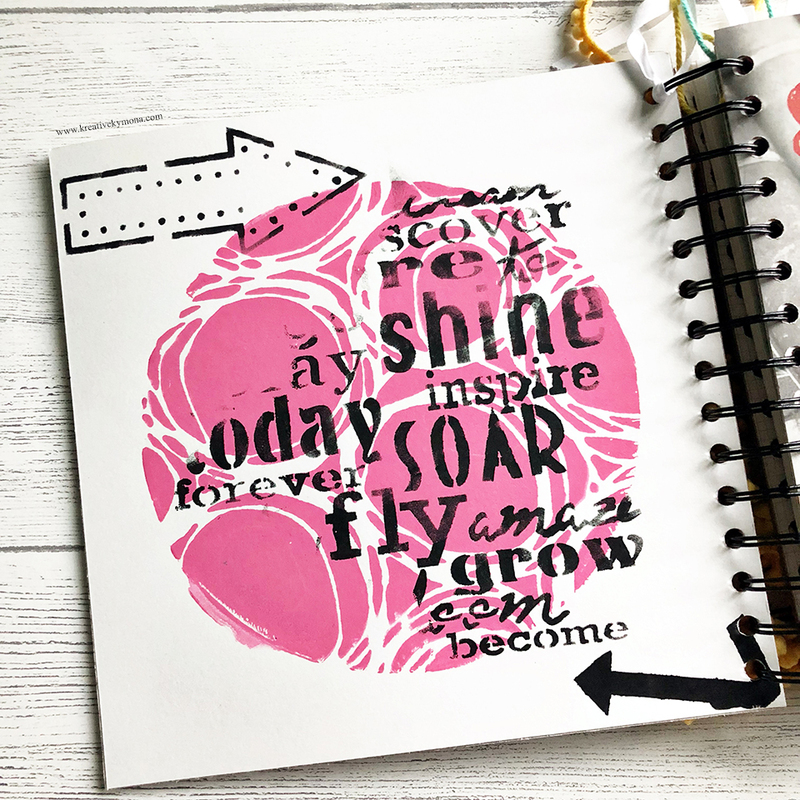 Kymona Tracey: 7 Creations with StencilGirl Products! Hello everyone!!! I'm over the top excited again today. I'm Guest Designing for StencilGirl today. I've been a member of StencilClub for a year now, and boy can I tell you I love all of the stencils that are sent to me each month! Stencils allow me to really let go and play with paint all day long with no care in the world. I just play and whatever my hands do, I just go with it!! LOL!! January brings about changes and new things. For me, January allows me to start over and change the way I see things. This year I want to live a fuller, happier life in everything I do. My projects will show you what I mean! For this page, I used the Jump For Joy Stencil by Jessica Sporn. I paired it with my favorite color purple with a touch of pink. 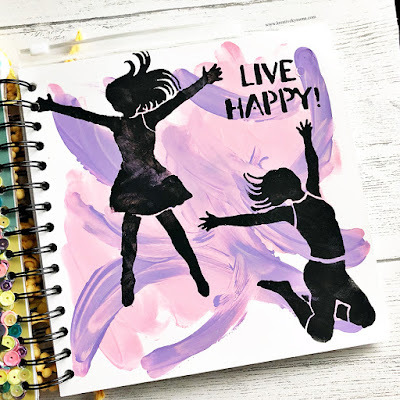 This stencil makes me happy and that is what I wanted to achieve when I was creating this page. 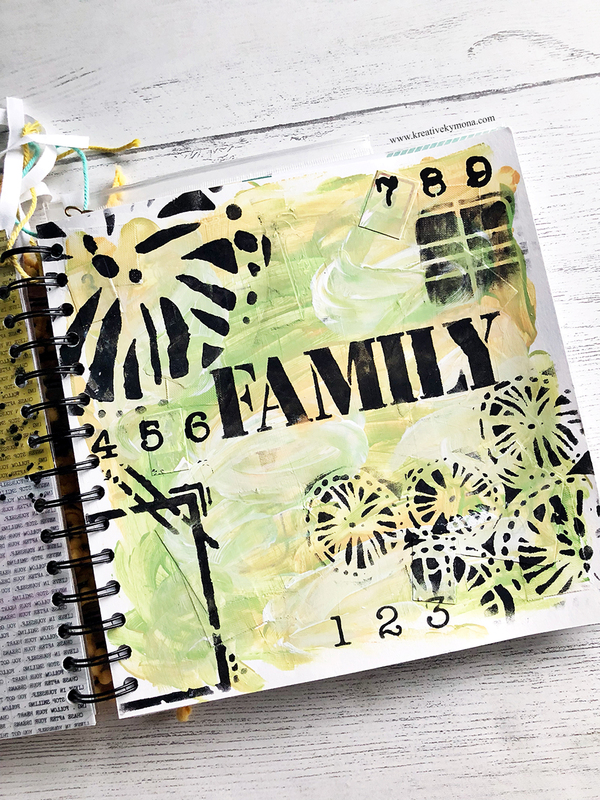 For my second page, I used my favorite stencil Circles, Circles by Traci Bautista and the 6-inch round Gelpress Plate. I also used Round Here Arrows Stencil by Mary C. Nasser and Now Is The Time Stencil by Carolyn Dube. I love this page because it gives a glimpse into what I want for myself in 2018!! For my third page, I used the Numbers Stencil by Seth Apter. I let the colors of paint guide me while creating this page. They are warm and bright. 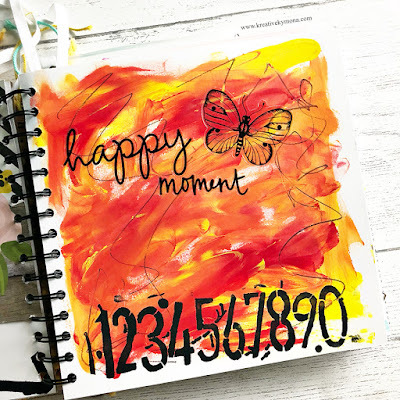 I used the number stencil to help me count off the happy moments in my life thus far. For my fourth and final page, I wanted to make sure I added family because my family is the most important people in my life. They give me strength, they make me laugh, they make me cry and they are the reason why I work so hard. I used the March 2017 StencilClub Kit by June Pfaff Daley. I love the clean font she used for the word family. It’s big and creates a bold statement. I also used Deconstructed Della Robbia ClusterMask and Stencil by Traci Bautista, ATC Mixup 1 by Mary Beth Shaw and Urban Outsiders Stencil by Seth Apter. OMG, I have to say I love this project!! I took a pair of old jeans that ripped and created this super cute Hoop Stencil Pocket! 1. Cut the pocket of the ripped jeans. 2. Stencil the mini sun created by Mary Nasser from the August 2017 StencilClub kit with teal paint. 3. Once that dries, place a sentiment sticker in the center of the sun. 4. 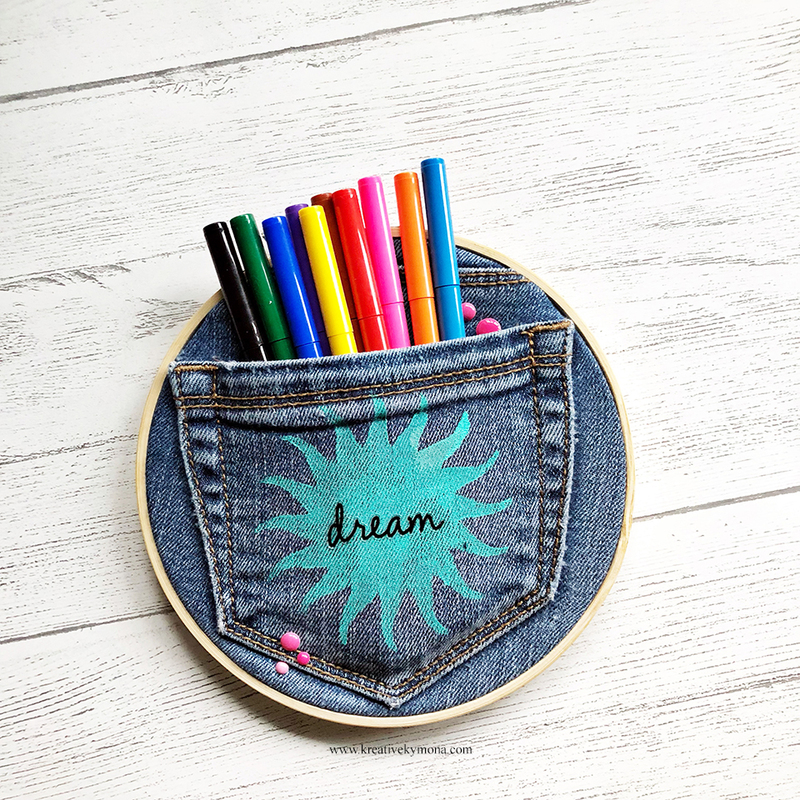 Then use a 6-inch embroidery hoop and pulled the jeans through the hoop as tight as I could. 5. Add additional embellishments, to give it character. 6. Cut off any excess material in the back. 7. 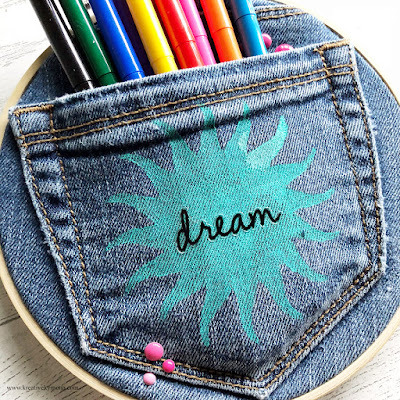 Add your favorite writing or art supplies in the pocket. Hang this hoop up on the wall right above or next to your desk. This is hanging up in my office at work. My coworkers love it. They think it’s the cutest thing they've ever seen. It tickles me pink. For this project, I used a metal bookmark that I found in my office that was left by the person that retired. So instead of throwing it way, I could paint it and stencil on it and send it to a friend I haven't seen in awhile. 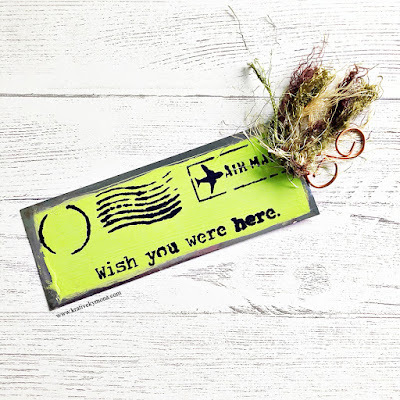 I painted the center of the bookmark and stenciled on it using the August 2017 StencilClub Postcard Image created Mary C. Nasser. 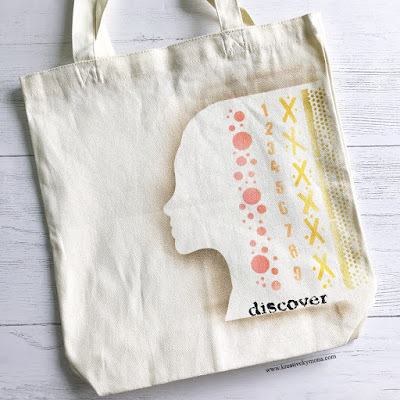 For this project, I decorated a canvas tote bag with StencilGirl December 2017 Borderlines stencil by Seth Apter. I used distress inks to create the outline of the young ladies face on the tote bag. I added my one little word "discover" to remind myself what I want to accomplish in 2018. So what do you think? What are you creating in 2018? I would love to hear from you. Thanks again, StencilGirl Products, for having me!! Kymona is a woman who never slows down and loves it. Yes... she is the energizer bunny's sister. She keeps going and going. She is a single mom of two wonderful children, 19 and 10 years of age. Besides running from one activity to another with them, she works full time at a hospital, teaches high school students on the weekends and has a huge love of learning new things. 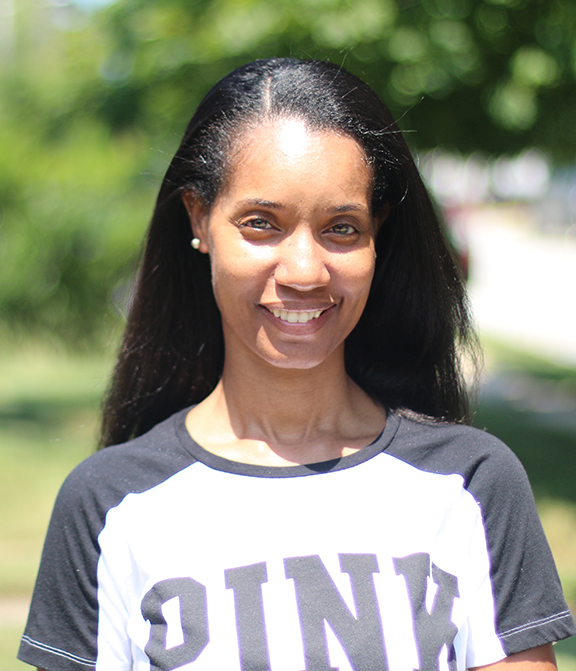 Kymona started scrapbooking when her son was born and has been paper-crafting ever since. Kymona also has a love for card making, photography, knitting and mixed media. Besides being a mom, Kymona thinks crafting has been one of the most rewarding accomplishments. According to her, being able to share with the world community makes life so rewarding! I just want to say that I love your book! 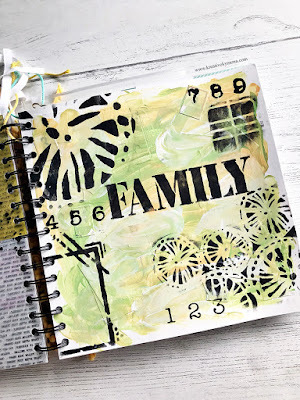 Those square pages are perfect and I super adore the way that you used that round Gelli plate on it. Its such a great combo! Beautiful! Excellent projects! Reminds me that simple is still beautiful and always works with journal pages. Love your ideas! Thank you for sharing! Oh WOW!! These projects are so different but oh so COOL!! I LOVE the little pocket one with the jeans!! I love all of your projects but the one that really caught my eye was the canvas bag. Thanks for sharing your amazing creativity!